Matthew and Renee married at Shingle Creek in Orlando, Florida in a traditional Christian ceremony that was both touching and heartfelt. 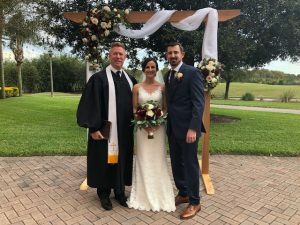 Rev.Glynn Ferguson with the Orlando Team of Sensational Ceremonies, worked with the two of them to craft a beautiful ceremony that fit the two of them perfectly. They chose the Blessing of the Hands and followed Rev.Glynn’s advice and did his homework assignment; to write and say why they love each other. ” Out of the whole wedding planning process this particular task is the one that has been giving me the most grief! Not because I was afraid that I will not be able to come up with some clever romantic reasons on why I would be marrying Renee, but simply because I’m not the best at putting my feelings on paper. The truth as to why I love Renee is simple and clichéd. The reason I love Renee is that I honestly just could not imagine life without her. Besides my relationship with Christ, she is the most important thing in my life. Her presence lights up my world! She is priceless to me. The relationship we have grew out of mutual respect for one another and a willingness to compromise when needed. She has always allowed me, supported me, and encouraged me to be the best person and man that I can be. With her I am a better man than I thought could be possible. She has always allowed me to lead our young family. A prime example is that we both live in different cities, I live in Jacksonville, she lives in Orlando. Yet, she has put enough love, faith, and trust in me to decide that we will be making our home in Jacksonville. By doing this, she is giving up her job, where she is a superstar. She’ll be humble about it but she is phenomenal at her job. She is also giving up her home where she is less than 5 minutes away from her entire immediate family. Nieces, nephews, brother, sister, and parents. With that being said, if it would make her happy and if she really wanted it, I would give it all up in Jacksonville and be in Orlando the first chance I could get, yet she has never expressed doubt about the decisions I have made for our family. She is also one of the most loving and kind people I have ever known, and that’s saying a lot for a guy who grew up with southern roots. Every morning when we are together, without fail, she will always make my cup of coffee before she begins hers. Every weekend when I come down, she does my laundry, she prepares our meals, and she always greets me with the biggest smile and most sincere embrace. She nurtures me when I am sick and supports me with all of my endeavors. I am truly a blessed man, Renee is MUCH better than I could ever deserve! Nicole Pepper with Nicole Squared Events was the coordinator for the evening and she took charge to make sure every detail was taken care of. Lesley with Flowers by Lesley created magic with the beautiful floral arrangements she crafted for the couple’s bouquets, boutonnieres, table, and ceremony decor.